Early in the second quarter, as I write this note, the U.S. stock market stands at an all-time high. 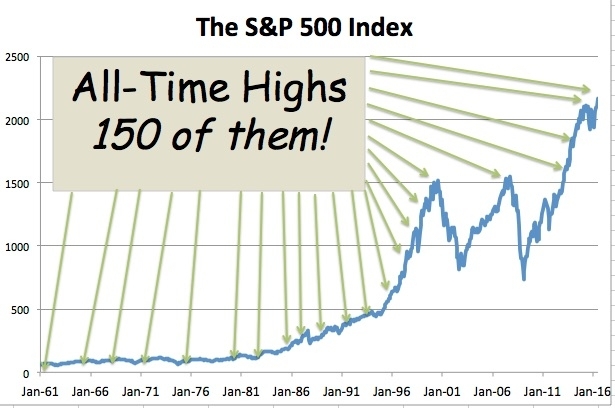 “All-time high” is a phrase you’ve likely heard quite a bit, especially in the context of the stock market. That’s because each month there is a 23% chance the market is at an all-time high. How did I get this number? History, of course! It comes from the S&P 500 returns on a monthly basis going back to 1961. In the 666 months beginning with the January 1961 through June 2016, the market ended the month at an all-time high 150 times. Said another way, if you invested in January of 1961, 23% of the time since you would have had a larger portfolio than ever before. Incredible, right? If we look back even further, the numbers are quite similar. Even going back to the 1800s, markets have always been in a long-term upward trend. Simply put, when you own a broadly diversified stock portfolio you own a share of a wide range of companies. Companies exist to make profits for their shareholders and, generally speaking, they do an excellent job, especially in free-flowing markets. The trend toward free trade, global markets, and lower costs of doing business has been in place since the first cave man traded a mess of coconuts for a dilong. And, friends, that’s a very long time! So, how is it possible to be anything but an optimist about the long-term market trend? Yes, and isn’t that wonderful! For the investor who is still socking money away, they get to buy stocks on sale. Their actual returns will be much higher than the index because they are putting money to work at the lows! And don’t forget the reason stocks have a return premium is exactly because of this volatility. Without it, their returns would be as low as your savings account. They, along with most everyone else concerned about their finances, should have a financial plan in place that helps them get through market volatility. It’s beyond the scope here to talk about exactly how, but I’ll just say this: If you are beyond your saving years and are living off your portfolio, be sure to have sufficient flexibility regarding where you fund your expenses so you can minimize portfolio liquidations while securities are on sale. Remember, your financial plan is much more important and comes far ahead any investment strategy!